Around the turn of the millennium, the nightscape of the Burning Man festival looked a museum of phantasmagoric technologies, and especially engines of flicker, from xoetropes to cinema to laser light shows to huge, kerosene-fueled bonfires, fire being the old ones’ TV. For years one cushion-bedecked tent was outfitted with a tall, rapidly spinning cylinder whose stacks of evenly spaced holes created a festival of flicker creating as many trip flicks in the brains of the prone Burners as there were Burner brains to tweak. 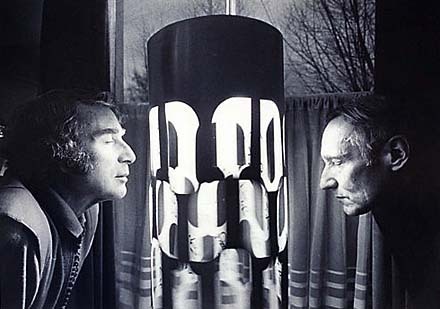 This was the Dream Machine, an effective device for generating altered states invented in the late Fifties by Brion Gysin, a sorta Canadian, sorta Moroccan, sorta British bohemian man of mystery who was best friends with the much more famous William Burroughs. Gysin made art, wrote fiction and poetry, shot films and conjured up infernal devices, but remains an elusive figure, as if he never really found the right medium for his peculiar charisma and distinctly postwar occult genius. FLicKeR iS a new Dream MachHine documentary directed by Nik Sheehan, who is apparently much beloved of rAndOM CapITaL LetTerS. We begin with Sheehan carting a new and beautifully engineered Dream Machine around and testing it out on rock stars, DJs, and old cronies of Gysin, who died in 1986. 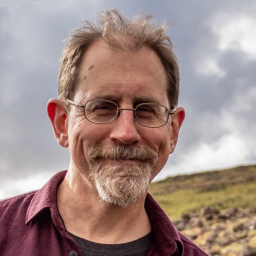 For the most part, hearing their reactions to the device is no more interesting than hearing about people’s pot trips, but because Sheehan picked some perceptive—if not always particularly germane—trippers, the talking heads give good talk. Sitting in a comfortable New York loft with his eyes closed (which is the best way to let the Dream Machine’s pulsing frequency bring on the alpha waves and audio-visual stimuli that can trigger trance), Sonic Youth’s Lee Renaldo, not only describes beautiful clouds of color but points out the device’s connection to early cinematic devices. Unfortunately, this is the only time this vital vein of flicker tech is even mentioned in the film. The brain science behind the effect gets a bit more time, but in general this is a very average documentary that blows more chances for excellence and depth than it exploits. The written voice-over material is terribly banal, with potted histories of the Beats and Hassan i Sabbah (illustrated with cheesy CG that brings back 1992 rave graphics), and a legion of unfortunate phrases. For example, Gysin is described as a “serious dabbler in the occult” (a serious dabbler?) and his machine as a “portal into the space-time continuum.” I mean, aren’t we already stuck inside the space-time continuum? Didn’t these guys want to find a way out? That said, the material Sheehan covers is fascinating, and I was able to right off the location-hopping and skippy editing as an exercise in the cut-up practice that Gysin also invented before passing on to Dr. Bill. Now I don’t have to watch those challenging Burroughs films from the Sixties all the way through. I also got to see a great clip of a 1983 TV interview with Gysin, where the man is so charming and amiable that you barely blink an eye when he takes a big honking drag off a joint and passes it to the interviewer. Then you realize a secret of his magical ingenuity: the guy was stoned all the time, though somehow without dulling his wit or perspicacity. Kenneth Anger—who shows off his Lucifer tattoo and seems in unusually friendly spirits—even argued that the Machine only really worked if you had a head full of hash. As FLicKeR proceeds, you realize that there is a fundamental ambiguity about the Dream Machine that helps explain why, say, the film screening I saw at an obscure art museum screen was totally sold out. Was it a piece of kinetic sculpture, a rival to TV, a conceptual artwork, a drug, a toy? Think about it hard enough, and the Dream Machine really is the “end of art” that Gysin declared it was, since with it the artist is merely a technician, furnishing the occasion for your own neurology to tell you tales. Gysin’s technical approach to the imaginal powers of consciousness, and the assumption that these tools resisted consensus reality, echoes the rhetoric that was already building up around LSD. But do such trances really resist Control? Isn’t it more true to say that the altered states mapped by the occult postwar avant-garde have now been subsumed into what we still might call the spectacle? After all, Gysin and the mathematician Ian Sommerville, who designed the technical specs for the machine, were influenced by William Grey Walter’s popular book The Living Brain; given the two men’s obsession with technological Control, the fact that Walter was also an early cyberneticist who built light-controlled robots takes you to the very lip of Chapel Perilous. And all this talk of Control seems rather quaint in an age that takes surveillance and data-mining as routinely as we do. The now delightfully bizarre Genesis P. Orridge, whose M2F transformation has landed him/her somewhere between a Revlon rep and a soccer mom, simply argues that the forces of Control that Gysin and Burroughs fought through cut-ups and mind scrambles are now so pervasive that the real issue we are now fighting is simply inertia. His hopes for the human race seem modest to say the least. And there is a pop side of the equation as well. John Geiger, whose nifty book The Chapel of Extreme Experience formed the basis of this doc, points out that the marginalized Gysin saw the Dream Machine as a ticket as much as a portal. Unfortunately, his attempts to commercialize its “drugless high”—at one point he approached Phillips—had no more luck than any number of other projects that Gysin launched in his erratic career. Ace countercultural historian Marcus Boon points out that whatever occult force Gyson had conjured up through his various aesthetic practices—and the fact that he conjured something up, Boon points out, is evident in the fact that we are still talking about him—also seemed to swallow him up as well. At the close of the film, Iggy Pop—who earlier described being deeply moved when Gysin gave him a copy of Let the Mice In, which he then lost—wheels out the Dream Machine at the close of a Paris concert. The crowd screams, the lights go down, and there is Iggy, wiggling like a sea monster in the ambient flicker. But nobody shuts their eyes. Nobody goes within. And then the house lights go up.